Recorded: Super Bowl, Sun City, Bophuthatswana, South Africa on October 19th, 1984. Comments: The first silver pressed 2cd from this show. Info says full show. Soundboard recording. I point out that this not means the same quality as a officially released live album. Soundboard means recording of the music which comes out of the loudspeakers. It is not set up extra microphones that captures the audience mood. It's stage microphones that captures the audience sound. It's most often somewhat low on the recording like this. Nerveless, this is a great bootleg release. 'God Save The Queen' at the end is might missing. I'm not sure it was done. I guess so, but I don't have this bootleg yet. Roots: From a soundboard recording. This is incident,. ridiculous, ridiculous sound board album is I have come out! This work, infamous even the history of QUEEN, 1984 年 South Africa “Sun City performance” whole picture live album of the press 2CD that captures the. 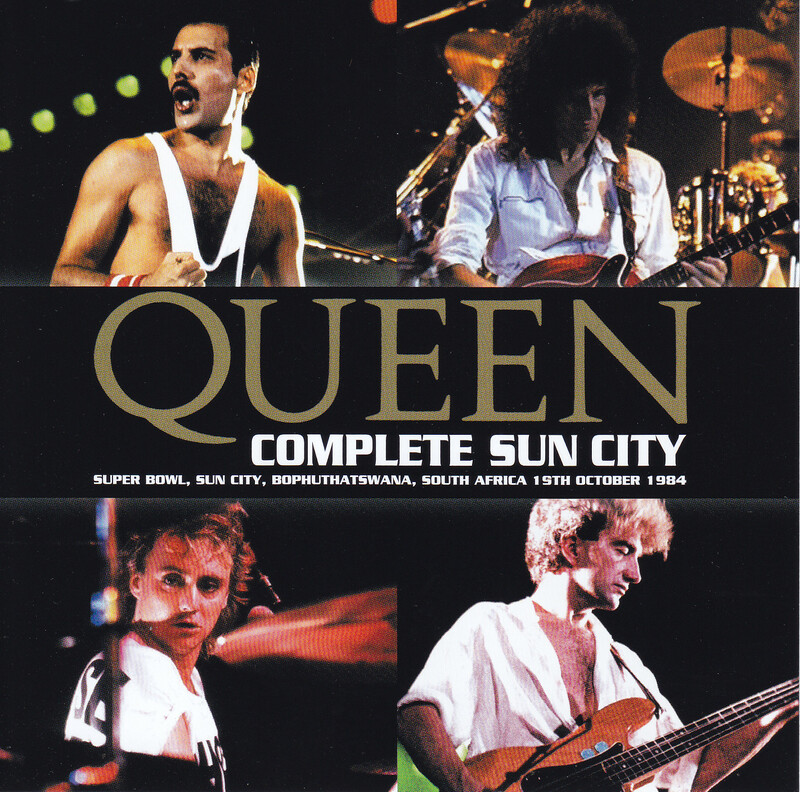 Yes, it’s the full version of “SUN CITY” that shook the QUEEN mania around the world in 2009! It is even excuse to explain too late to people of QUEEN fan but, just in case. The Sun City, at that time, the South African resort, which has been condemned from all over the world in the apartheid policy. Although cultural boycott had been called from the United Nations, QUEEN that to beat it was forced to live. As a result, it is the band itself is live of Iwakutsuki that had supposed to be condemned from all over the world. This work is the outflow sound board sound source was recorded 8 the Sun City performances had all nine times. Only the first half of the live in 2009 is excavated, released as a gift CDR “SUN CITY”. This appeared also, it was tremendous shock. After all, it until absolutely no sound source recorded even be famous in history, Sun City performances that were not found at most dates. Starting with BLACK SABBATH, but musicians that made the live in his place will have also to other, that there was little that the sound source came out. Live recordings from the dark continent, yet, because I’ve been jumped suddenly in the table directly connected sound board! 6 years since this impact appears to would not again. Wow, was suddenly appeared second half Become a 2015. 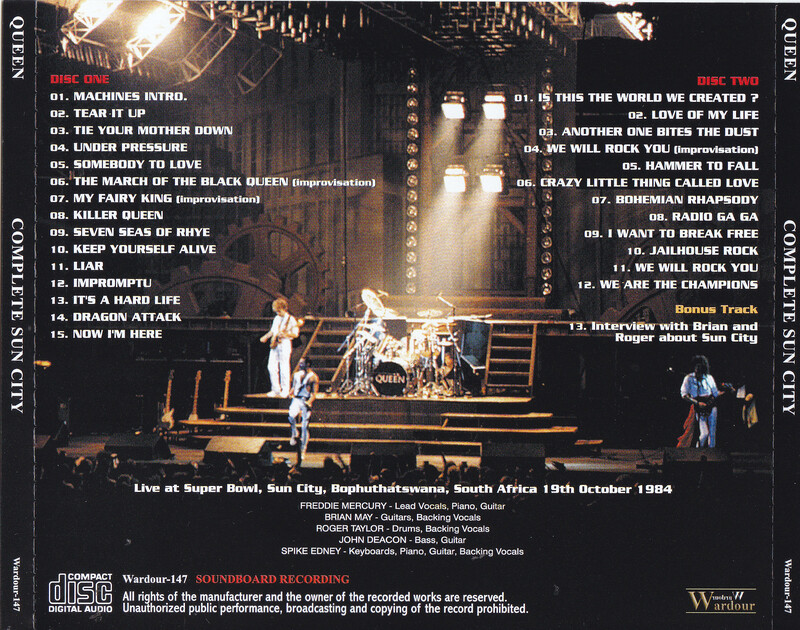 Right now, it’s a live album is made to abuzz the QUEEN mania around the world !! You think you know if bonus CDR If you have been experiencing “SUN CITY”, but only to the cheers resound far only table directly. Playing course, up to the every corner of the effect effect, are all of the music is direct sound coming into the ear without any shielding. In addition, the contents of the live that has been recorded in the sound, but also shock. Negative image as described above’s the intense “Sun City performance,” but the reality is far from Negative, it’s a extremely great live. When “THE WORKS TOUR” and say, you can see the tired to Freddie, but I or there is also live lacking good enough hot air, this work is very best condition. To incorporate the play Majieru the “The March Of The Black Queen,” “My Fairy King” early in improvisation (Rhea !!!) I, also high note of “Seven Seas Of Rhye” it down pat. Motivated also I also an unrivaled superb stage tone. Effortlessly and jump the octave, powerful song that worked the intonation in passion plenty continues until the end of the last. At all, it is quite impressive. Not only song, let alone always be playing team street, passion outpouring exceed much it. After “I decided to go with careful consideration nearly a year. And I'm wanted to be a help of people who are the anti-apartheid movement” told Brian to because you will was not a lie. Standing in the land of South Africa, they to play the “I Want To Break Free”, which has been sung as protest song of the anti-apartheid local. Cheers of this work, until the sound of scraping the strings I only hear slightly distant from the other side of the real last sound, but still is it is seen as the certainly powerful. It is originally band not interested in political things, but it was really tragedy was not understood in the world. At the end of this work, embarrassment of such members I was also recorded 17 and a half minutes of interview transmitted to the real. Brian and Roger 1986 radio interview that appeared, in the question of to Sun City performance, two people carefully respond while choice words. That time is the only Sun City performance that could not be felt as one of the news, and precisely because listen immediately after the finale that arose in the field, is a vivid is the gap between the cold reaction of the world. After just a good faith was greeted enthusiastic, this pursuit was waiting. It is a bonus that feeling is felt painfully at the time of the members. Just notoriety is the historic “Sun City performance”, but had been waged in the field, it was just to QUEEN lock that was lively Hachikiren. After this, in response to the barrage of large international bashing in addition to the long-standing relationship, was forced to the dissolution just before them. Also good 1985 South America, Australia, I’ve continued to Japan and tour, it may not have been up to LIVE AID you change the …… fate to become a so much enthusiastic performance. It is a large excavation that becomes the major event in the history of sound source, but history and geographically to the mass of the whole volume of valuable also. Come on it “THE WORKS TOUR” even the best sound, it is one that is aligned to the highest live. I do not know whether I wrote the other many times the word “must listen board”, I would have set aside if you come and know have been out this amazing album. Thoroughly must listen board that would be up to such a strange regret. Do you will need to not listen! ?